A beautiful gypsy with beautifully ornate clothing, reading tarot cards! 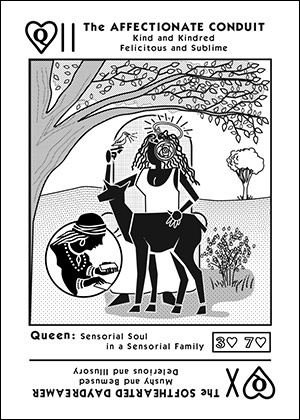 A Sensorial Soul in a Sensorial Family. Sympathetic, because, like the 3 of [X] she is soothing to the psyche. Conduit, because, like the 7 of [X] her imagination connects you to the light of life. Kind, because, like the 3 of [X] she loves everyone. Caring, because, like the 7 of [X] she is sublime.